As a child, American human rights activist Simon Deng survived brutal enslavement by Islamists and witnessed their destruction of his village in Sudan. 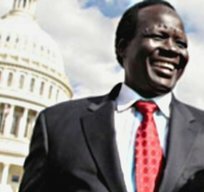 Today, at 50, Deng is an American citizen and one of the leading advocates for the rights of his people, the Christians of South Sudan. In 2006 he organized a walk from the United Nations to the Capitol in Washington D.C. to protest the massacre of Darfuri Muslims by the government of Sudan, the same government that he says has brutalized Sudan’s Christians, killing over three and a half million since 1955 through slaughter and starvation. Deng was joined on his historic Freedom Walk by basketball legend Manute Bol, originally of Sudan, who played for the Washington Bullets and the Philadelphia 76ers. The march received coverage in the New York Daily News and other outlets, gaining Deng an audience with President George W. Bush, whose efforts to end the war between Sudan’s Islamist government and the country’s Christian and animist populations produced a Comprehensive Peace Agreement (CPA) in 2005. This agreement provides for a referendum, in 2011, in which South Sudanese Christians will have the opportunity to vote to form an autonomous nation. Today, Deng reports that Sudan’s Islamist government in the north is failing to abide by the CPA, resulting in chronic food shortages, sporadic violence, and insecurity among Christians in the south. With high hopes for South Sudan’s independence, Deng is working to promote alliance among the U.S. government, the Israeli government, and a future South Sudanese Christian state to promote international security. Recently the Center for Security Policy sat down with him to discuss these possibilities, and to report on his experiences on the African front of the war between radical Islamism and rest of the world. 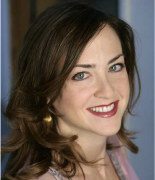 Heather Robinson: I understand you were the victim, as a child in the 1960’s, of the radical Islamist government of Sudan, which has waged war on its Christian population intermittently since 1955. Can you share with me a bit of your firsthand experiences of violence directed at Sudan’s Christians by the government? Simon Deng: As a child, the first words I was taught were, ‘When you see an Arab, you have to run, and you have to run for your life.’ Year after year, we came to know a routine. The village being burned, us being chased … [We spent] days in the bush which is full of hyenas, lions and snakes. We did not even have mosquito nets at that time. When we got one mosquito net, the whole village would preserve that for the kids, to be the ones under that mosquito net, and grownups had to stay out. SD: Yes. …Whenever we escaped, we came back to the village we loved and we [would] find the horrible smell of people who had been burned alive. I smelled this. The two elders, one blind, being burned alive. Grownup people, people who were too old to run. They were too weak to run, and one of them was blind. These were the people that I knew…that we used to play with…[They would] tell us history of the past, and now being told-remember, we are kids now-being told these are the people that were burned alive. It was a horrible thing. SD: The village [would be] going through burnings every year. The government [would] come and burn it down…not just human beings but this place, because according to them, we will go to the inner city, where we would be converted to Islam. None of us knew this was their policy. We only knew the horrible death, running when the machine guns come, seeing the bullets flying and seeing my friends being shot, two of them. There were five of us. We were seven, eight years old…And for us who remained running, if it was not for those who ran before us we would have just gone and gone and probably I would not be here. Because people had to run after us to stop us. SD: A lot of it…Omar al Bashir, the President of Sudan, has spoken about how he managed to achieve the objective [of] converting more Southerners to Islam than any other President before him. He did this not only through violence but through [withholding] food aid. When the government in the North got food from international organizations and the United Nations, he would control it. When starving [Christians] needed food he would say, ‘If you convert to Islam.’ When people are starving, they will do [what they have to] to eat. SD: In 1968, my father decided to take his family to stay in the city of Malaka, in Southern Sudan. He-this man who tricked me and took me into slavery-was in Malaka. His sister was a neighbor to us…He was there for a month and was on his way to the North [Muslim part of Sudan]. He …asked me to help him with his luggage. He was a neighbor. He took me to a boat and told me to sit next to his luggage because he has to go to the market and buy things and he will come back. SD: We were not in a place of war. The war was being carried out in the villages, and this is a town. But the war was being conducted in every single village in the Southern Sudan. Killing and slaughter was taking place outside the town…there [was] also killing within the cities by the government but not to compare [to the amount taking place in the villages]. HR: At that time, did you hear that black Africans were being enslaved by Arab Muslims in Sudan? I’m just surprised you were not suspicious. SD: I had not heard of it at the time, no…so I was not [suspicious] … The man didn’t come back immediately. What happened was, probably, he didn’t go to the market. Because when the boat started moving, when I started crying, he immediately came to tell me not to cry. To convince me the boat has left, there’s no way to stop so I can get out. The only way is to go to the last stop, a city in the North, Kosti. And he will put me on the next boat coming back to the South. When we arrive in Kosti it turns out he has three other kids that I didn’t know. They were on the boat [with him] too, probably from other cities. We got off together with this man in front…Probably he was tricking these kids [into slavery] the way he tricked me. Before we left Kosti for the village, he got rid of two kids. What happened to them, I don’t know. He sold them, I don’t know. He gave them away, I don’t know. I was just carrying [in my mind] what he told me, that he’ll put me on the next boat so I can go back to the Southern Sudan. SD: Yes, All Sudanese Christian kids. So, there is one other boy with us. It is two hours drive or maybe an hour. Everybody is happy when we arrive. This man came from the South and most important, he brought two slaves. I didn’t know what the word is then, what is a slave. The following morning there is a dispute, who is going to take the bigger kid? The other boy was bigger than me, by two years, I guess. Nobody wanted to take me because probably they knew what a slave will be doing, so they need somebody with physical ability, and I was a young child. I end up being given to a family, not a large family. I ask them where is Abulay? [the man who had kidnapped him but promised to return him to the South]. I was still [clinging to] this hope in my mind, you see. I was told I should not ask about him because I had been given to them by him – as a gift. Somebody may decide whether I get to go to sleep or not, whether I get to eat or not…if there is any leftovers, that is my food. I don’t have a regular place to sleep as a human being. My place can be anywhere, even the place where they keep the animals …I have to make sure this place is clean, because it is my duty to do all the domestic jobs. HR: You’ve spoken about how they offered you an option to be treated better? SD: At that time, those [blacks] who happened to be Muslim were being treated better, even though not as well as Arabs. But [those blacks who converted to Islam were treated] fifty times better than an ‘infidel’. For instance, if you acted like them and became a Muslim, you could share food with them, [not just leftovers]. SD: In this one way, believe it or not, the mother [of the family] was nice to me because there were…neighbors angry they did not force me into Islam, even to the point there were those willing to buy me from them so they could convert me to Islam. HR: It’s striking that in this one matter, religion, they seemed to have some respect for your choice. HR: Do you believe the way they dealt with the issue of your religion has something to do with the culture of radical Islam? In other words, was it part of their ideology to break your spirit first, so in their minds, they could believe they were giving you the “choice” to become a Muslim, when of course in reality it was not a real choice? SD: This is my story and what I went through. I would not speak so generally. But I will say, after I got out of slavery and looked back to where my dehumanization took place at the hands of the Muslims, I saw I was not alone. There are thousands of South Sudanese who went through what I went through. There were those that took the option to convert to Islam. And if you go to Sudan today you’ll be shocked to see South Sudanese who look like [me] with shilluk tribal mark … but [who] took the option to convert and get an Arab name. Some of them are even leaders in Sudan, in the North, being used by the North as footsoldiers [in the war to Islamicize the South]. This entry was written by Heather Robinson and posted on August 31, 2009 at 3:21 pm and filed under Profiles.